From Route 80, take exit 25, Route 206 north to Newton, about 12 miles. From Newton, make a left at the second traffic light (Route 206 and Spring Street) then make a left at the next light onto Route 519. Follow 519 for approximately 1/2 mile, then make a left onto Route 622 at Sussex County College sign. Follow Route 622 for about 4 1/2 miles. Turn left onto Route 619. The park entrance is about 1/2 mile south on Route 619. Picnicking: Picnic tables, picnic shelters, group picnic area, playground, food concession View the concession menu. Welcome to New Jersey’s first state park and historic landmark destination for outdoor recreation and leisure activities. Swartswood was established as New Jersey’s first state park in 1915 to ensure public access to the State’s third largest freshwater lake. Swartswood Lake is the park’s main attraction, welcoming visitors from all around to its calm waters for canoeing, kayaking, sailing, fishing, swimming or simply relaxing. Whether you prefer land or water, winter or summer, the park is open year-round with something to do every season. 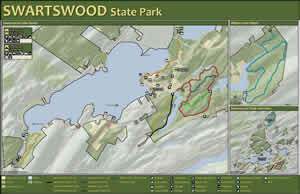 Swartswood State Park is located in Northwest New Jersey in the Ridge and Valley region of Sussex County, five miles west of Newton. Through the Carry-In/Carry-Out Program you can help us keep the parks clean and beautiful by carrying out the trash you carry in. Bags are provided throughout the site. Thank you for your cooperation and remember to recycle. February 25, 2019: Park Office is closed due to power loss from down trees. Swartswood Lake lowering is scheduled to begin October 16, 2018 and continue through March 1, 2019. Office Hours: Open daily 9 a.m. to 4 p.m. This 0.6 mile-paved path provides a level surface for walking, biking, roller blading, skate boarding and is accessible for persons with disabilities. The trail meanders through a forested area along Duck Pond. Wayside exhibits found along the trail provide information on the unique natural features found in the area. A bird blind has been constructed to allow visitors to view birdlife in the area with little disturbance to their habitat. This 2.8-mile trail begins at the end of the paved Duck Pond Trail. Follow the white markers along the natural hilly terrain through a secondary succession forest to the secluded Spring Lake. We consider this to be a moderate level hike. This 0.8 mile trail is marked in yellow and begins at the Duck Pond parking area just to the right of our kiosk. This is an easy to moderate hike on an earthen, hilly path. The trail ends where it meets the paved Duck Pond Trail allowing you to combine the two trails for a full loop back to the parking area. This 1.5 loop trail can be found at the most southern end of Swartswood Lake by the dam. The steep rocky terrain makes this a moderate to difficult hike with rewarding views of Swartswood Lake. Pet Friendly Campsites please click here for details on sites that are designated Pet Friendly, license and innoculation paperwork requirements and additional cost. Pet friendly sites are 42-45. Campsites: 65 tent and trailer sites with a fire ring, picnic table and lantern holder. Maximum occupancy is six at each site. Flush toilets and showers facilities are within walking distance. Trailer sanitary and water stations available. Campsites 1-21 open all year round. Campsites 22-65 Open April 1 to October 31. Fee: NJ Resident $20 per night; Non Resident $25 per night. Group Campsites: Three group sites with picnic tables, a fire ring and lantern holder. Water and sanitary units are within walking distance of each site. Campsites accommodate a maximum of 20 people. Open April 1 through October 31. Fee: NJ Resident $40 per night; Non Resident $80 per night. Shelters: Six shelters are located on top of a shady ridge. They are cabin-like structures with a wood stove for heat, two double deck bunks and a picnic style table. The shelters sleep a maximum four people, including children. Each site includes a fire ring, picnic table and lantern holder. Flush toilets are nearby and shower facilities are located in the main campground bathhouse .Additional tents are not permitted on shelter sites. Check in time is 3 p.m. and check out time is 12:00 Noon. Accessible to persons with disabilities. Open April 1 to December 15. Fee: NJ Resident $48 per night; Non Resident $60 per night. The freshwater angler can enjoy year-round fishing in Little Swartswood and Swartswood Lakes. The lakes are stocked with brown, rainbow and brook trout in the spring. Summer and fall catches include bass, sunfish, catfish, walleye, perch and pickerel. Fishing is available along the shores or by boat. Fishing also is permitted in the mill pond near Keen's Grist Mill. Fishing is subject to the New Jersey Division of Fish and Wildlife regulations. Most of the area east of County Route 619 is open to hunting. Game commonly found in the park includes ring-necked pheasant, ruffed grouse, wild turkey, gray squirrel, eastern cottontail and white-tailed deer. Hunting is subject to the New Jersey Division of Fish and Wildlife regulations. Secluded picnic areas overlooking the lake can be found throughout the park with picnic tables and grills available at each site. Charcoal fires must be contained to the metal grills provided at the site. Visitors are free to bring their own metal grills. Wood fires are not permitted. Food and refreshments are also offered at the concession stand. View the menu. A playground and open playing fields are located near the picnic area. Volleyball and basketball courts and open areas for frisbee, golf and softball are located in the day-use area of the park. Boat rentals are available in the park on a seasonal basis. Please call for hours of operation prior to your visit. The rental facility is typically open weekends only from May to the end of June. They are open seven days a week from July through Labor Day. For more information visit the Swartswood Lake Boat Rentals web site. Swimming is permiited in the designated swimming area while lifeguards are on duty. Please check our swimming schedule prior to your visit. Swimming hours are 10 am to 6 pm. Adjacent to the beach visitors can access facilities with changing areas, restrooms, showers, a first-aid station, and a concession building where food and beach supplies may be purchased. View the concession menu. The facilities are accessible for people with disabilities.